The moon will glow red this Sunday, when a total lunar eclipse will be visible in the Macon area. If the weather cooperates, people should be able to see the celestial event from anywhere, but they can get a magnified view from the Mercer campus that night. 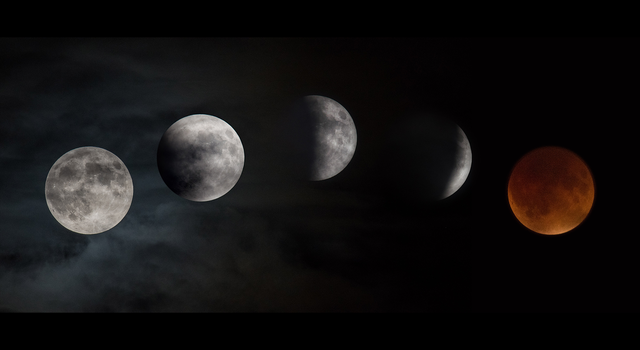 On Sunday, people may start to notice the moon darkening around 9:30 p.m. as the Earth’s shadow moves across it. The moon will be fully eclipsed by around 11:30 p.m. and look red due to how the sunlight is passed and refracted through the Earth’s atmosphere. The total eclipse or “blood moon” will last about an hour, and the moon will be back to its normal glow by 3 a.m. Monday. “You can see it from your backyard. The moon is so bright that it’s going to be really obvious when it starts to disappear,” Dr. Marone said. “Stay away from light as much as possible.” Lunar eclipses are not very rare. They happen several times a year, but they are not always total eclipses. It all depends on the location where they are being viewed, and partial eclipses may be barely noticeable, Dr. Marone said. However, Jan. 20 will be the last chance to witness a total lunar eclipse for a little while. There won’t be another one visible from Earth until May 2021, according to NASA. Dr. Marone hosts a few public astronomy events each semester. As part of his astronomy class (PHY 115), he always does a Sidewalk Astronomy night. His students record the responses of other students and community members as they look through telescopes set up on campus. He said it’s a first-in-a-lifetime experience for some people, and the students reflect on being able to help provide that new opportunity. Mercer will have more opportunities for public outreach through astronomy in the future after an observatory is built off campus. The University had been leasing about 160 acres in Crawford County to use for Dr. Marone’s astronomy lab classes and bought that land last summer. If the weather is clear, Dr. Marone and his students transport telescopes and other equipment to the site once a week to observe the night sky. While a timeline has not yet been established for completion of the observatory, preliminary designs have been created and a large telescope has been acquired to go inside it.